Massachusetts Lt. Gov. Karyn Polito today visited Northampton to talk with local officials about the commitment the administration of Gov. Charlie Baker is making to the state’s cities and towns. Polito said the administration is working to develop specific “community compacts” with local governments that will be used as a guide when awarding state grants to fund local projects.
" The idea of the compact is to make sure we are spreading state funds throughout our commonwealth and the money does not just land in Boston," she said. The agreements the administration will ask municipal officials to sign will pledge mutual accountability, best government practices, and promises by the state to reduce red tape, according to Polito.
" About 80 percent of it will be the same across the commonwealth, and 20 percent will be specific to that community, or region where the community sits," she said. The lieutenant governor has been touring the state holding meetings with municipal officials since January. She met privately in Northampton City Hall Tuesday with Mayor David Narkewicz and members of his cabinet and then spoke with reporters. "Northampton is very well run. There is a good forward looking team here we would like to partner with to help get Northampton to the next level. If Northampton does well, all the communities around it will do well," she said. Polito said more specifics on how the administration plans to partner with cities and towns will emerge after she completes her listening tour in another couple of months. The new administration has shown a commitment to local governments from the start. Baker’s first executive order after taking office in January directed the release of $100 million in previously frozen funding for local road and bridge projects. He proposed a 3.6 percent increase in local aid in his first state budget proposal. The administration last month announced $30 million to help cities and towns fix potholes and repair other damage from the harsh winter. Narkewicz made it clear he welcomes the attention the Baker administration is paying to local governments. He turned to Polito and jokingly asked if she had brought her checkbook. Narkewicz said he also raised the issue of energy costs in the meeting with Polito. He urged the administration to keep funding incentive programs to encourage the development of more solar power .
" We worked hard in Northampton to cut our energy costs by about 20 percent through a very creative energy bonding program, but now we are starting to see increases in electric and gas costs. Anyway we can continue to realize savings in energy is good not only for the environment, but also for our municipal budget and taxpayers," he said. 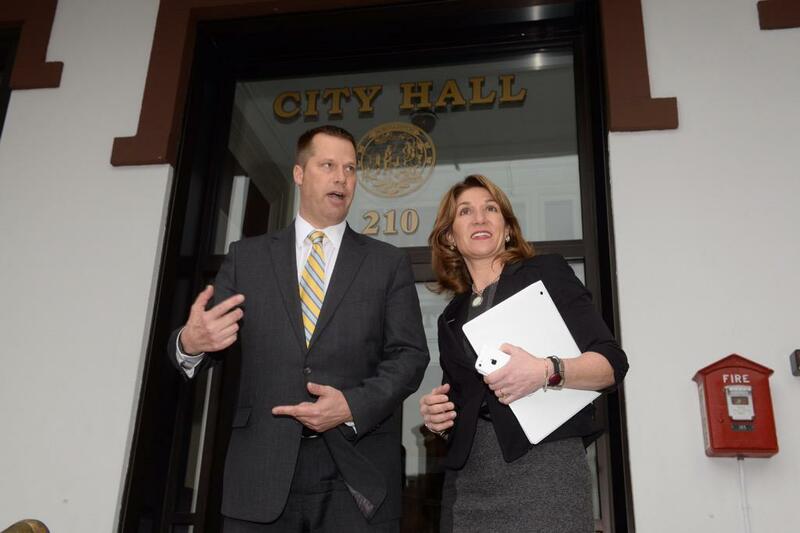 After the meeting in Northampton, Polito was scheduled to meet with Easthampton Mayor Karen Cadieux. The administration of Governor Charlie Baker is seeking to strengthen ties between Massachusetts state government and local municipalities. Baker’s first executive order as governor dealt with municipal relations. Declaring it was time to write the next chapter in the history of the Commonwealth, Charlie Baker today became the 72nd governor of Massachusetts. The state also has a new lieutenant governor, an office that had been vacant for the last 19 months. Baker put his hand on the family bible held by his wife Lauren, with their three children at his side, as State Senate President Stan Rosenberg administered the oath of office. It capped a political comeback for Baker and the return of a Republican to the state’s top elected office.